We can’t believe we are already half way done with Session Three of CrossRoad! Our day began with Orthros led by Fr. Simeon and was followed by Be Still Time. A beautiful way to fill our hearts and souls with peace. We then had our second day of Theology and Scripture classes. These lectures and sessions have sparked thoughtful and insightful questions and comments from the participants! After lunch we were joined by Vanessa Constantinides from the Hellenic College Holy Cross Admissions Office. She spoke to us about how college can play a part in our vocation and encouraged us to apply to our school. Staff-member Devon then led a session on “Faith and Science” and discussed the relationship between the two with the CrossRoaders. Tonight, we had a very special staff-led activity: “Night with the Saints.” In this session, the participants were divided into small groups to “meet” different Saints and learn what sainthood means. We then had the very unique opportunity to join the Serbian Orthodox summer camp of the Midwest Diocese at the New Gracanica Church in Libertyville, IL. We joined their 100+ youth and counselors for a meal and fellowship prepared by their staff; we were so grateful for their hospitality! Fr. Dragan Petrou-a Director of the program- invited our participants to stand up and share some words about their CrossRoad experience so far. They all had such insightful and inspiring things to say- it has been a privilege to watch them learn and grow so much over these past few days. 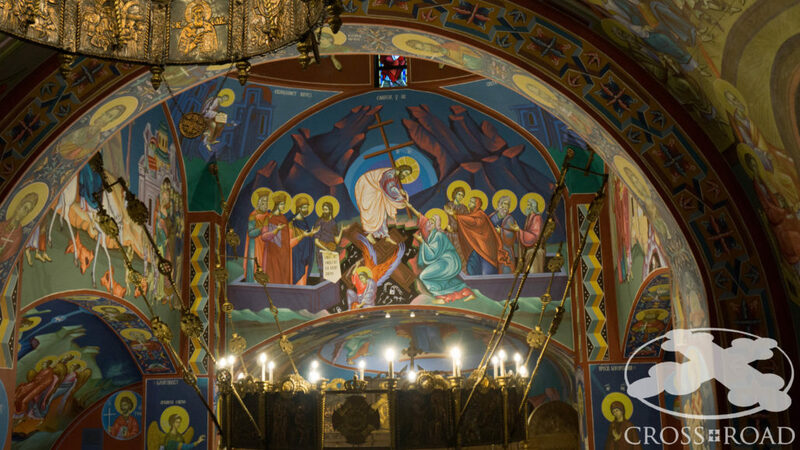 The most impactful portion of the evening was getting a tour of their church-which was painted from floor to ceiling in vibrant icons- and then traveling to St. Sava Monastery with the Midwest Diocese program to participate in an Akathist to the newly canonized St. Mardarije. The opening of his tomb just last year revealed St. Mardarije’s holy relics to be incorrupt. Hundreds of voices echoed throughout the church lifting up our prayers. It was a true blessing to be able to venerate the relics of a Saint with our new friends and brothers and sisters in Christ. A powerful and moving experience, it left many of our participants and staff in tears; overwhelmed with emotions of love and joy. The takeaway of the evening was that every person has the opportunity and calling to be a Saint. We are so grateful to be together and learning so much in this wonderful community.